Chasing King of the Mountain and Queen of the Mountain segments on Strava is so passe. All of the elite Freezing Saddles participants are now competing to be King of the Trail or Queen of the Trail. Being KoT or QoT is easy. All you have to do is volunteer to take care of the parks and trails that provide safe places and beautiful views while you're on your bike. I'll post opportunities to score points here and encourage others to do the same. Points are available for any activity involving improving a trail, a park or a waterway. To score points, post a description of the awesome thing you did along with a picture. Slam that stem on your carbon fiber trash grabber and get to work. The King of the Trail and the Queen of the Trail will win a super neat prize to be determined, which I promise is not a framed picture of Lord of the Mark. Last edited by Judd; 01-15-2019 at 11:32 PM. Furloughed and feeling down? Fret not. Four Mile Run Conservatory is hosting a Furlough Friday Special from noon to 2 this Friday. You'll have the opportunity to help clean up the wetlands in South Four Mile Run Park that are a haven for wildlife along the trail. This is a really fun organization that's working to preserve, restore and improve Four Mile Run. They also have cool equipment like waders to lend if you're interested in really diving in. We're going retroactive to January 1st. Two points for Chris for a solo act of goodness by removing a branch from the Mount Vernon Trail and helping other trail users avoid injury. An additional 1 point has been award for doing good without the promise of award. While you were all enjoying beer and falafel at the Happy Hour, I was out with the Pike Ride team (Colorado Springs bike share) cleaning up a section of the Shooks Run Trail. Here is the gang rolling out. and the "After" shot of a section I cleaned up (I got that little red thing after I shot the photo!). No amount of editing and rotating results in the photos upright, sorry. Kate's on the board with a five pointer for participating in a trail clean up. Two additional points have been awarded for doing it on a bike share. 7 points! Kate is pulling in to an early lead. Josephine from the Friends of the Mount Vernon Trail has organized this year's first FOMVT Snow Patrol Team event. With snow expected this weekend and NPS furloughed, the snow patrol will ensure that the path from LBJ Memorial Grove to the 14th St Bridge will be cleared so that folks can still get across the river. As an extra incentive, this event will award DOUBLE KOT and QOT points. Plus, it's pretty fun. Potential bonus points if you make a snow angel. Not pictured: the muddy, abandoned red kids' bike that someone pulled out the streambed. Seeing that made me sad. 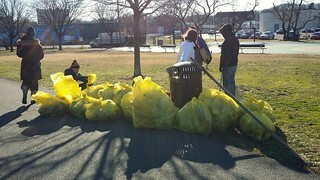 Organizers of trash cleanup events should have more trash bags on hand than they think they'll need. Manipulating a trash grabber and an oversize trash bag is awkward when you're a short person with T-Rex arms, like me. When you're picking up bottles and cans, turn them upside down to empty out all the nasty liquid inside before you put them in your trash bag. Eww. The beer-drinking bozos who like to toss their empties at the end of the Four Mile Run Wetlands Trail favor Heineken or Tecate. That area has lots of thorny plants. Ow, ow, ow. Josephine is on the board with five points! An additional point has been awarded for sharing trail cleanup pro tips. Another point has been awarded for surviving the thorn bushes. 7 points total.